During the football season, I’ve gotten in the writing habit of picking a “Sunday Word”, and using it to describe what happened the previous week. I’ve been slack in getting this going this preseason, but the only possible word that can perfectly summarize this Lehigh football offseason is “pro“. The NCAA’s big ad campaign for years now has been that “most athletes go ‘pro’ in something other than sports”. And for the great majority of Lehigh athletes, year-in and year-out, this is still true. But this offseason we’ve seen an unprecedented number of Lehigh athletes trying their hand at ‘pro’ ball – and Lehigh fans everywhere couldn’t be more thrilled or excited. There are a lot of “pro” adventures to follow for Lehigh fans right now, and it’s damned exciting stuff. It may be 21 days until the start of Lehigh’s football season, but there’s plenty of football on TV for Lehigh fans to get excited about tonight. For all the information you need on catching LB Billy Boyko, OG Will Rackley and WR Ryan Spadola this weekend, just check below the flip. Future NFL players spend their drafts differently. Some spend it in celebration with friends in the city, or surrounded by family at home. Some of the big names have the cameras embedded with the players, awaiting with baited breath their reactions, or their expressions of relief. But LB Billy Boyko didn’t do much different than he does many weekends. Working on his father’s dragster during “the season opener of the Sunoco Race Fuels Money Trail,” a release from the Maple Grove Raceway said, he “kept two cell phones in his pockets at all times,” awaiting the call from his agent about a possible late round draft pick or a late free agency pickup. Saturday night, the phone rang with a call from the Raiders. 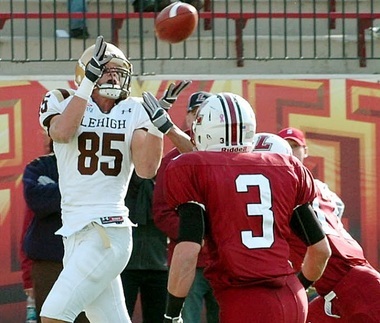 Out of 128 seasons of Lehigh football, only ten teams have enjoyed ten victories or more, and the 2012 chapter of Lehigh football was one of those ten rare teams. Most of the ten victories did not come easy, which, combined with the perception of a weak schedule, had to be the reason why Lehigh was the first 10 Division I-win school since the expansion of the playoffs to 20 teams to be denied a playoff bid. That shouldn’t take away from the great accomplishment of this 2012 Mountain Hawk team, however. There is plenty to celebrate from 2012, and plenty of good things to write about. The cardiac 28-26 victory at sold-out Liberty, in front of nearly 20,000 intense fans, before the Flames would end up being Big South co-champions. The heart-stopping wins against Fordham, Holy Cross and Georgetown, which all came down to the last play. And, of course, falling behind 21-10 early to Lafayette in the 148th version of “The Rivalry”, before roaring to a 38-21 victory and shotting out the Leopards for three consecutive quarters. For this last post of 2012, we celebrate the wins one more time, and unveil the Hawks of the 2012 season. 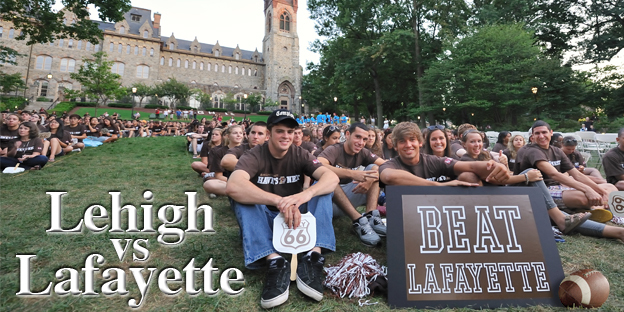 When you study “The Rivalry” as long as I have, the overall trends of Lehigh students, Lafayette students, the football players, and the citizens of Bethlehem and Easton break apart, and the individual stories from each specific instance come to the fore. Specific “game to end all games”, detailed game riots, freezing games, or unusually hot games get broken out, sometimes breaking from the normal expectations of The Rivalry in general. The Rivalry endures, and there are similar stories of seasons being made, or broken, or riots, or order, but occasionally games do have variation. Not every Rivalry game is the same.. The story of the 148th meeting of the most-played rivalry in all of college football is probably more different than anyone might have ever imagined before the season. For Lafayette, the story is one of unmet expectations, unbelievable tragedy, and, ultimately, they hope, redemption. For Lehigh, the story is one of nerves, loss of destiny, and, ultimately, they hope, redemption.